(Nanowerk News) Using an "electric prism", scientists have found a new way of separating water molecules that differ only in their nuclear spin states and, under normal conditions, do not part ways. Since water is such a fundamental molecule in the universe, the recent study may impact a multitude of research areas ranging from biology to astrophysics. The research team from the Center for Free-Electron Laser Science (CFEL) – a collaboration of DESY, the Max Planck Society and Universität Hamburg – reported its results in the journal Angewandte Chemie International Edition ("Separating Para and Ortho Water"). At first glance, water seems to be a simple molecule in which a single oxygen atom is bound to two hydrogen atoms. However, it is more complex when taking into account hydrogen’s nuclear spin – a property reminiscent of a rotation of its nucleus about its own axis. The spin of a single hydrogen can assume two different orientations, symbolized as up and down. Thus, the spins of water’s two hydrogen atoms can either add up, called ortho water, or cancel out, called para water. Ortho and para states are also said to be symmetric and antisymmetric, respectively. Yet, the CFEL researchers have now demonstrated a way of isolating para and ortho water. To start, the scientists placed a drop of water in a compartment, which they pressurized with neon or argon gas. This mixture was released into vacuum through a pulsed valve. “Due to the large pressure difference, the gas expands quickly into the vacuum when the valve is opened, dragging along water molecules and, at the same time, cooling them down,” says Daniel Horke, the first author of the study. The molecular beam then travels through a strong electric field, which deflects the water molecules from their original flight path and acts like a prism for nuclear spin states. 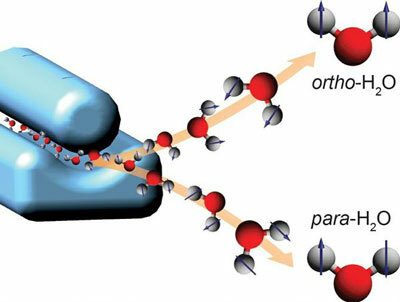 “Para and ortho water interact with the electric field differently,” Horke explains. “Thus, they also get deflected differently, allowing us to separate them in space and obtain pure para and ortho samples.” Spectroscopy showed that the purity of the para and ortho water was 74 per cent and over 97 per cent, respectively. Especially for para water the purity can be greatly enhanced in the future, as Horke says. Storing the separated water species was not an aim of the study.